Adjustable concentration, relaxation and ramp time. Adjustable Pulse amplitude, width & frequency. These products require a prescription from a licensed medical professional. Please fax your prescriptions to 973-854-8650 after placing your order. 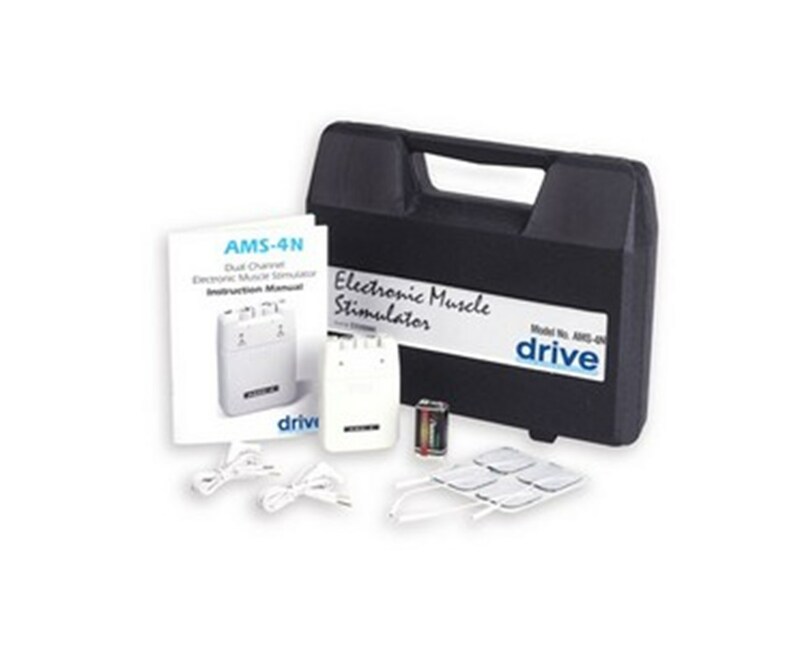 Drive Medical's electronic TENS muscle stimulator with timer provides maximum therapy by delivering electrical waves making it the ultimate in muscle stimulation therapy. It retrains muscle tissue with Electrical Muscle Stimulation (EMS), a proven, efficient way of treating muscle rehabilitation by the transmission of electronic pulses. When directed by a doctor or therapist EMS can be an effective method of physical therapy and is done using a TENS stimulator . This portable TENS unit's dual isolated channels allow for independent adjustment of each lead wire allowing for various adjustments to ensure proper treatment as instructed. The muscle stimulator can be adjusted to meet your needs. The product can be attached by a metal belt clip. It comes complete with a carrying case, 2 lead wires, a 9-volt battery, 1 package of pre-gelled electrodes and an operating manual. It is protected by a 3-year limited warranty. Intensity control is adjustable from 0-80 mA, 500 ohm load. Pulse rate is adjustable from 2-150 Hz. Dual isolated channels. Pulse width is selectable: 100, 200, or 300 micro-seconds. Contraction time is adjustable from 2-30 seconds. Relaxation time is adjustable from 1-30 seconds. Ramp time is adjustable from 1-6 seconds.